Instead of chocolate bunnies, why not indulge in some gourmet Easter cookies this spring? 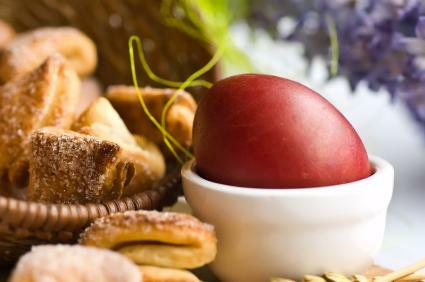 You can find Easter cookie recipes in many cultures around the world. When you make them with superior ingredients, these gourmet cookies will have you celebrating spring all year long. Nearly every culture that celebrates Easter, also celebrates spring with a long history of cookie baking. In Mexico, cookies are baked with lime for a refreshing taste, while in Lebanon, an entire week is devoted to the baking of Ma'amoul, a rose petal-flavored cookie filled with nuts or dates. In Jordan, cookies are flavored with honey for a complex, sweet taste. Whether you celebrate Easter with traditional foods and desserts, or you're interested in broadening your cultural horizons, gourmet Easter cookies can be made in a variety of ways. Usher in spring and Easter with any of these cookie recipes. Stir two teaspoons of fresh lime juice with milk and set aside. Add in the egg, zest, flour, baking powder, baking soda and milk mixture, stirring well. Drop in tablespoons onto a greased cookie sheet and bake for 20 minutes at 350 degrees. While the cookies cool, combine the remaining lime juice and sugar to form a glaze. Brush the glaze onto the cooled cookies and allow to harden before serving. Ghrabi is a Lebanese cookie made for Easter each spring. These gourmet Easter cookies work best when the freshest and most top-shelf ingredients are used. Slowly add the flour, mixing well until the dough is extremely thick and moldable. Slice the chilled dough into 1/4-inch thick rounds and arrange on a baking sheet lined with parchment paper. Bake at 350 degrees for 15 minutes or until the cookies begin to brown on the edges. Allow the cookies to cool completely before handling - cookies will be extremely fragile. These stiff honey cookies have a rich taste perfect for spring. Heat the shortening, sugar and honey together in a saucepan over low heat, stirring until thoroughly combined. In a separate bowl, combine the eggs, flour, ginger, vanilla and baking powder. Gradually add the flour mixture to the cooled honey mixture, stirring constantly. Drop by the teaspoon onto baking sheets lined with parchment paper. If baking isn't your forte, you can still serve gourmet cookies for Easter by purchasing them from a number of gourmet baking companies. Any of the following vendors will provide you with the perfect cookies for your Easter celebration. Whether you bake or purchase your Easter cookies, be sure to present them in a style fitting the occasion. Easter baskets, colored eggs and ribbons, as well as fresh greenery, will make sure that your Easter cookies look as good as they taste.